FTY : Can you introduce yourself? I make melodic instrumental electronic music as ‘Northcape’. It’s a mix of downtempo, ambient and IDM. It is supposed to be a fictional place, obviously later I found out it was a real one as well. Apart from being in a church choir when I was at school (! ), I did have some piano lessons when I was younger but I didn’t get very far with it, I was always more interested in composition (basically, messing around with the keyboard, preferably an electronic one) than learning how to read music properly. Most of what I do is self-taught and instinctive rather than based on music theory. An honest attempt to make music that evokes something that I find hard to express in any other way. FTY : You have just recently released Glasshouse, can you tell me about it? 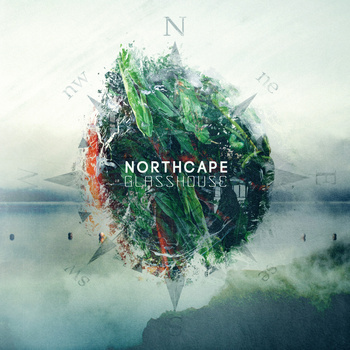 My music tends to not be too complicated, but with Glasshouse in particular I had a quite straightforward approach to composition and wasn’t worried about the tracks being simple in structure, the sound and feel was more important. I was going for a detailed, warm and analogue-sounding collection of tracks. Some of the detail and feel of the tracks comes from the inspiration behind the EP – I was thinking of plants and genetics and I see the EP as a kind of combination of local, small-scale detail and larger ideas and atmosphere. I feel this is reflected really well in the cover by Futurorg which is absolutely stunning. FTY : Can you describe the process you use in writing and recording your music. Where do the ideas from the songs come from? Obviously being an electronic artist, electronic synthesis is very important in what I do, I generally start with a sound, and I am very selective about what sounds I use. The next step is normally a melody, then a bassline or beat, and once the track reaches a critical mass I go from there. It’s quite a natural process when it works well, and it’s the final part of production that takes the most time. I feel that my best music is always inspired or somehow strongly connected to ideas outside music – a theme, memory or idea that creates the energy behind the composition process and influences the end result. That said, I reject probably 90% of the ideas I come up with – sometimes fairly quickly, but frequently I just get bored with them – I’m not interested in releasing stuff that isn’t worth releasing. FTY : You have recorded a few albums, including this latest album, on the Sun Sea Sky record label. How did that partnership kick off and how important is it to be connected to a label? Although of course it’s much easier to release independently than it used to be, I think labels can benefit artists in a number of ways, I think a good label builds up trust among its listeners that it will release quality material and that benefits all of the artists on the label. There is so much music out there of varying quality that, as a listener, I find that good labels really help by acting as a kind of filter… Personally think that being on a label has really helped give my music credibility and, even though it is a relatively small independent, it has still given me opportunities, such as access to reviewers, that I wouldn’t otherwise have had. Also, on a practical level, the quality of the artwork on the recent releases is far higher than it would have been if I hadn’t been signed to a label that is so rigorous about the quality of everything that it puts out! At the time that I connected with Sun Sea Sky I was already looking around for a label for my next release and Shawn, the label boss, contacted me unexpectedly through my website, as he had heard and liked my album ‘Detach’ which I self-released a few years previously. I think his friend heard it on last.fm which I was quite active on at the time. Once I heard some of the previous material released by the label, in particular Boc Scadet and Lights Out Asia’s ‘Garmonia’, which I was blown away by, I decided this was a good label to go for. I haven’t been disappointed, Shawn is a dedicated supporter of independent music who puts a lot of work into the label releases and distribution. I think (Northcape aside ;-)) he has a really strong current group of artists as well as some gems in the back catalogue. Unfortunately I don’t find it is any easier, which is a bit disappointing! I have definitely learnt a lot about the production techniques involved in making electronic music, but I find that as I improve, I also become a more demanding critic of my own music… I’m always becoming aware of the mistakes I made in the past and trying not to repeat them, it’s a constant learning process and that’s one reason why I find it such an interesting activity. FTY : If you could collaborate with anyone in the world, who would it be and why? This is a really tough question… I’d probably be intimidated collaborating with any of my musical heroes. It’s one of those questions where whatever answer I give, I’ll instantly think it’s wrong, and possibly a bit arrogant… It would have to be an artist who’s sound I think I could add something to though, so either a completely different genre, probably with vocals, or maybe a pure ambient artist. I used to be on a number of dedicated music sites, and gained quite a few listeners and some confidence by doing that, but unfortunately many sites no longer exist or have very little activity compared to the past, and at the moment I only use sites that everyone will have heard of – it’s become too polarised. Facebook has become far too dominant and is an increasingly bad place to promote music. I use twitter a lot, the simplicity of it has always appealed to me, and there is much more interaction, I like the informal nature of the site. Apart from these, I’m obviously on soundcloud as well which is probably the best site at the moment for getting at least a few listeners. The landscape is always changing and I think there’s no substitute for having your own website – it’s not safe to rely completely on social media. FTY : What advice would you give to any artist playing instrumental electronic music starting out today? Try to find a good music production forum or site where like-minded people are actually prepared to give honest and useful feedback rather than just exchange insincere compliments (easier said than done! ), and, although having a few listeners is never a bad thing, always prioritise and focus on making and improving your music ahead of getting plays. Don’t expect to make music that is high enough quality to get released on a good label or netlabel straight away – put as much as you feel is sensible out there at first purely to get feedback (maybe under a pseudonym!) and gradually refine your output. Finding people who’s opinion you respect and who are prepared to spend time honestly reviewing your music is immensely valuable, obviously you have to be prepared to do the same thing. FTY : Who or what has been your biggest musical influence? I always mention Boards of Canada at this point in interviews as they were a massive inspiration to me, though I’ve never tried to replicate any artist’s style – which would be futile with BOC anyway – they have definitely affected my own approach to music. FTY : What music did you listen to when growing up? I didn’t actually get into listening to music until relatively late as a teenager, but one of the first bands that I really liked was U2. Later I was into a lot of 90s guitar-based music, bands like Blur, Suede, Elastica, Super Furry Animals, Supergrass – a lot of britpop bands. Actually listening to electronic music didn’t come until later – it’s an obsession that developed gradually. Sierra Leone’s Refugee All Stars – “No Feel Bad O”. FTY : What does the future hold for Northcape? I’m in-between projects at the moment, so I’m not sure what will be the next larger-scale release. There’s lots of directions I could go in, but at the moment it’s not clear… I do have a few unreleased tracks lined up for various purposes, I’ve also just finished a vocal remix for IDM artist ‘Pinklogik’ which should be out soon.